From January 18 to January 20, 2019, UCSC’s Stevenson Event Center was transformed into a bustling playground for a diverse group of over 600 hackers to turn their visions for social change into a presentable project for 50 judges representing various tech companies. The 36 hours of hacking were as hectic as they were productive. As hackers downed bottle after bottle of Yerba Mate and Soylent, mentors and event sponsors were available to advise teams on their project ideas and work out any challenges they encountered along the way. Of the roughly 600 attendees who participated, 62% were UCSC students while the rest hailed from outside the university. 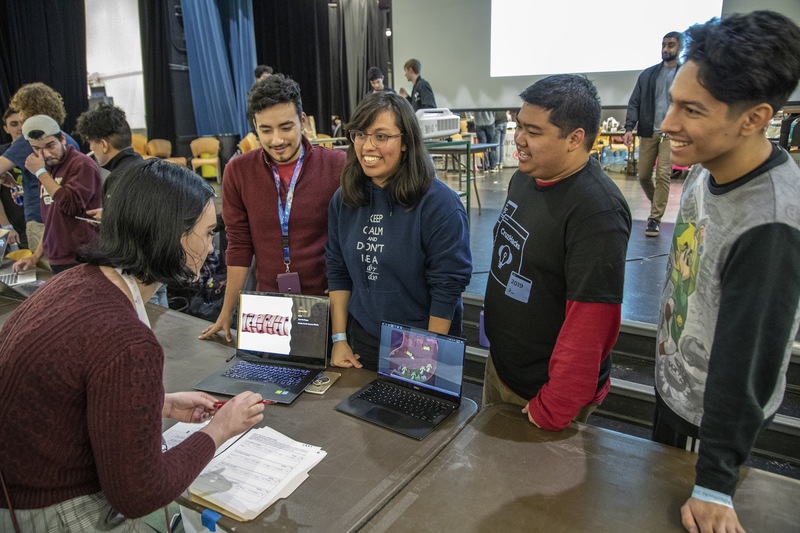 This shows that not only did the event garner interest within the local community, but also that in its sixth year, CruzHacks has established itself as having a considerable amount of credibility outside the circles of Santa Cruz. Among the non-UCSC participants were other UC students, high schoolers, and college students from all around the U.S. (including one team from the University of Waterloo in Canada!). A main goal of this year’s event was to cater to all skill levels and this was achieved through a multitude of ways throughout the weekend, including the several workshops that were offered. Technical workshops addressed topics such as Python, web development, Git, and machine learning. Nontechnical workshops focused on building other skills such as how to land an internship and how to pitch a project. Collaboration and skill-building were constant throughout the weekend, supported by 16 workshops aimed towards various skill levels. With an emphasis on creating an event friendly to beginners, CruzHacks achieved 47% of its participation from first time hackers and accordingly a Best Beginner Hack prize category was established, with the winner receiving an Inboard M1 electric skateboard. With feedback from last year’s attendees in mind, CruzHacks 2019 offered a much wider array of dining and beverage options throughout the event. Partnerships with LifeAid and Yerba Mate resulted in the two companies generously providing free drinks for the event. In regards to food, healthier options were available this year such as HoM Korean Kitchen and Ike’s Sandwiches. Sponsors played a key role in the event, their presence offered both project assistance as well as inspiration to build projects using their networks. With Silicon Valley so close by, many companies sent over representatives such as Google and Microsoft. Sticking to the true nature of CruzHacks being a collaborative event of the local community, Santa Cruz companies such as Amazon Alexa, Product Ops, and Plantronics were also on site ready to help. ProductOps documents their employees’ experience creating a prize category and mentoring students at CruzHacks here. The involvement of Major League Hacking (MLH), a company that operates a league for student hackathons and sends a representative over to help operate the event throughout the weekend, was crucial to the event’s success. MLH added a new dimension to the event by providing tons of rentable hardware to students, expanding the possibilities of hackers’ project ideas. In fact, one of the winning teams fully took this to their advantage by building a glove which uses an IoT device to be controlled according to human movements. The applications of their project are far-reaching with visions of being used for drones, medical surgeries, and VR platforms among many other possibilities. Check out their project! efforts from the student organizers, volunteers, sponsors, mentors, and judges. Each of these groups played a unique role in ensuring that the event operated efficiently and that student hackers (no matter their experience level) were able to work hard on a project that they truly believed in. Congratulations to everyone who came out to participate, and especially to winners in each respective prize category. Check them out below!